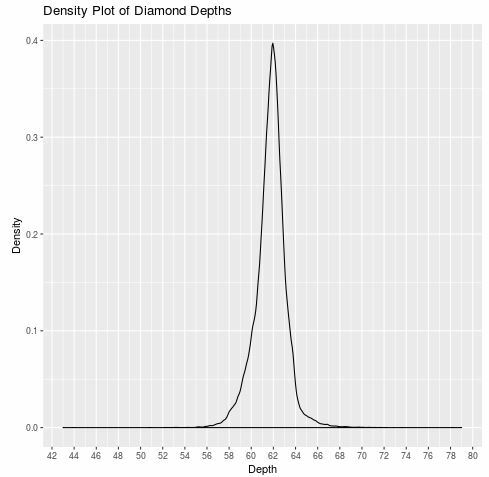 In statistics, we’re often interested in understanding how a particular variable is distributed in a dataset. 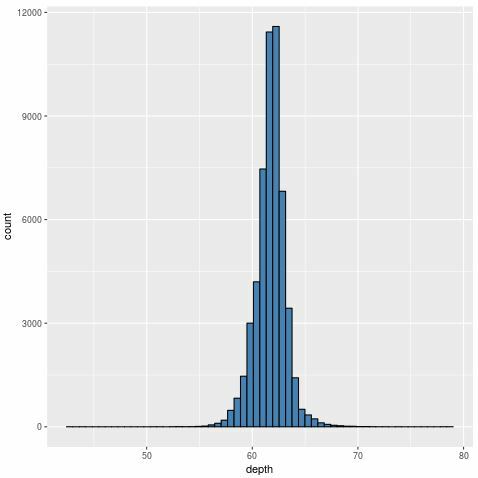 One common way to visualize the distribution of a variable is to create a histogram, which uses bars to represent frequencies of data values. 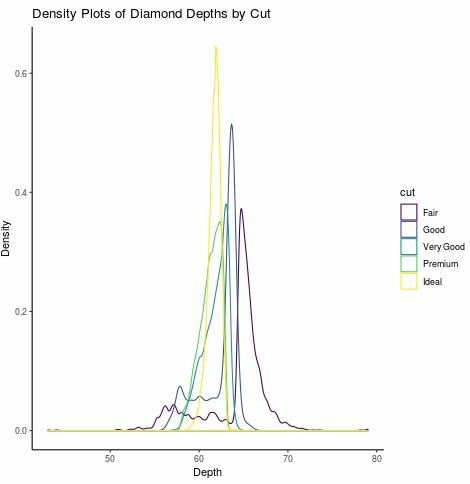 This allows us to easily see that most of the values for depth are concentrated around 63, with some values as low as about 55 and some values as high as almost 70. 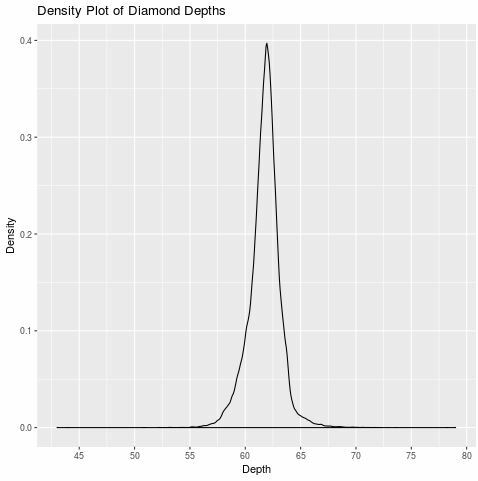 In general, we can see that the distribution is fairly concentrated and not very spread out. Notice that the more bins we use, the “smoother” the histogram begins to appear. In fact, we could represent this distribution with one smooth continuous curve by simply using a density plot, which produces a curve that shows the distribution of the data using a method known as kernel density estimation. 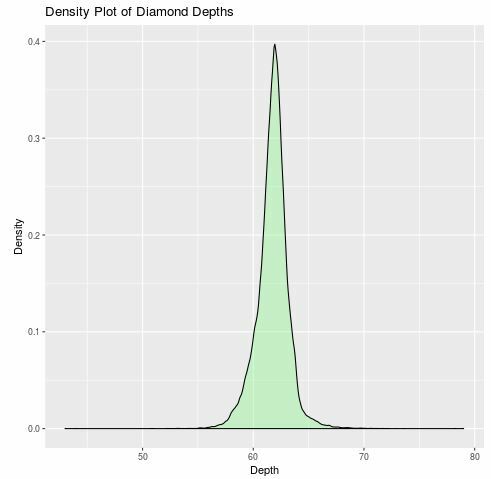 Notice that this plot has the same shape as the histograms we showed before, but we’re able to see this shape through the use of one single curve, as opposed to several bars. 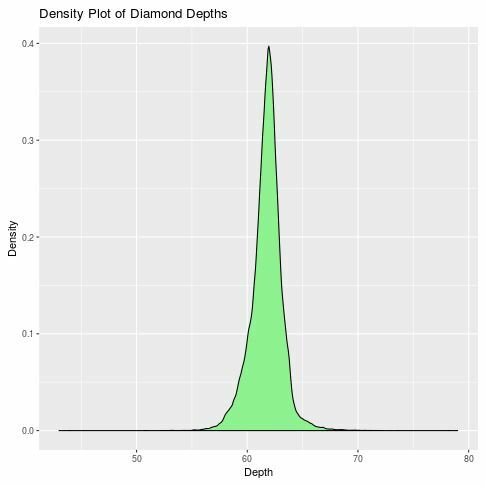 We’ve seen how to create a basic density plot. 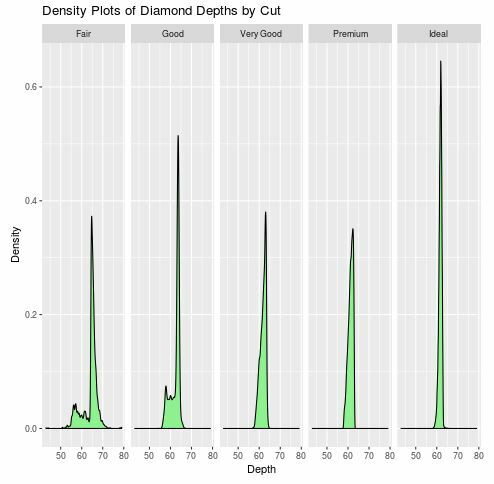 Now we’ll show how to modify the aesthetics of the plot to add titles, axis labels, axis ticks, colors, legends, and more. 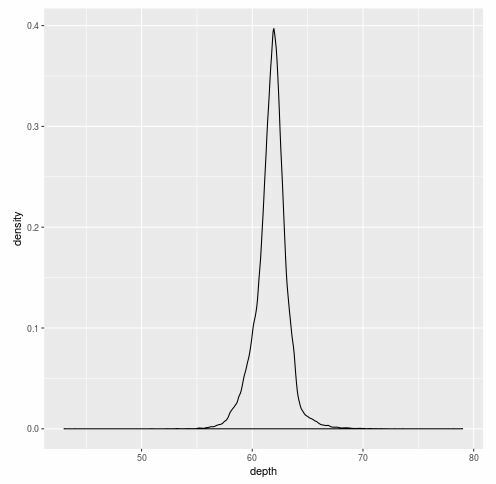 We can also modify the number of tick marks that show up on the x-axis by using the scale_x_continuous() argument. 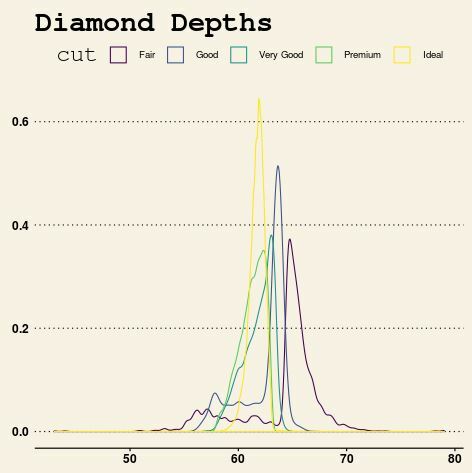 In addition, we can specify how transparent we’d like the fill color to be in the chart by using the alpha argument, which ranges from 0 to 1. 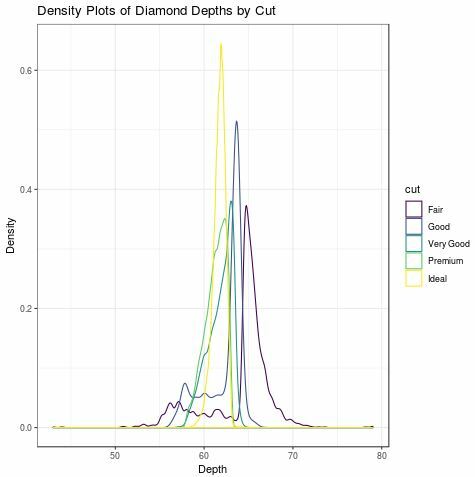 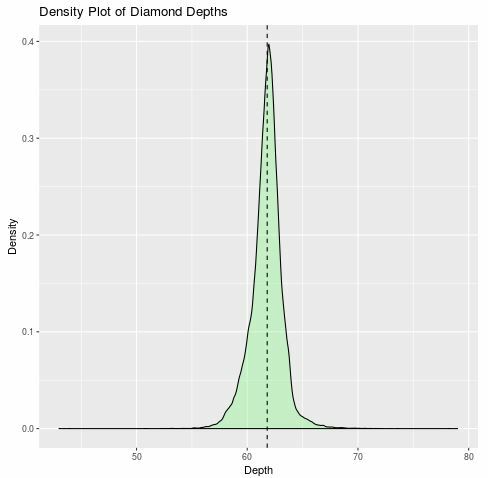 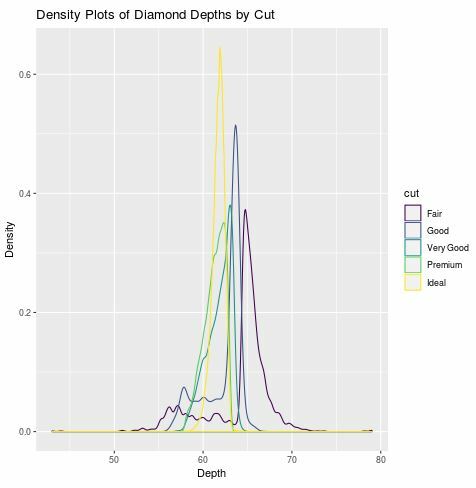 This gives us an easy way to see how the distribution of depth varies based on the value of cut. 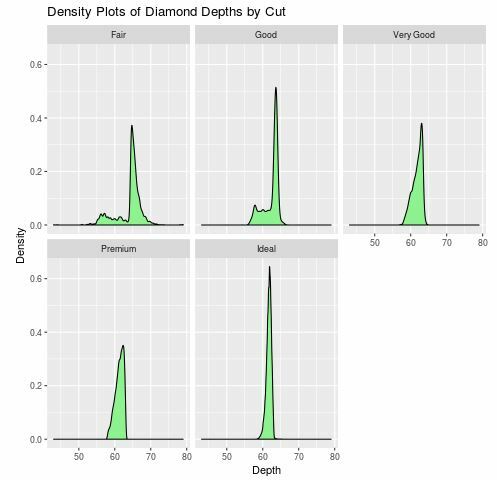 For example, we see that the values of depth are quite concentrated for the “Ideal” cut, but they’re much more spread out for the “Fair” cut. 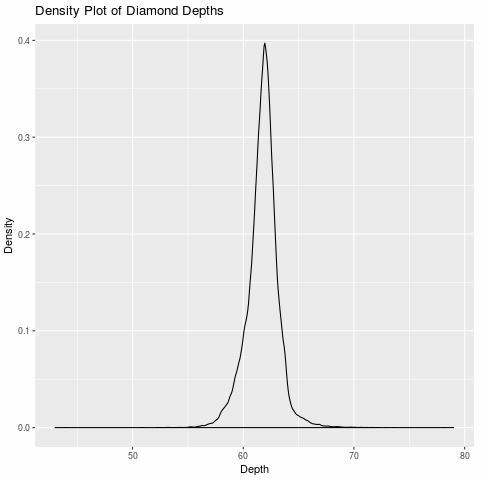 Lastly, we can change the theme of the density plot if we’d like. 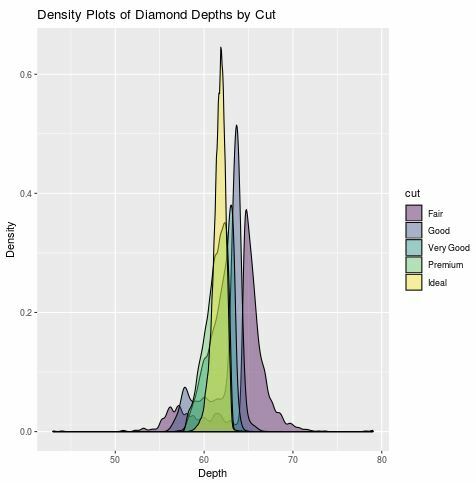 For a complete list of built-in ggplot2 themes, check out the complete ggplot2 documentation. 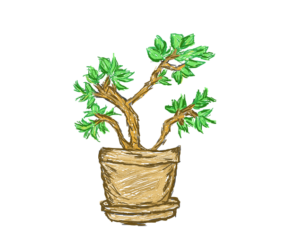 For a complete list of ggthemes, check out the documentation page.